Bernhard Strigel was a leading German painter and draughtsman who worked in the service of the Emperor Maximilian. His early works reveal the influence of Schongauer’s prints, while his later output was influenced by Dieric Bouts and Hans Holbein and also reveals a knowledge of Dürer’s painting. In this panel, Strigel depicts The Annunciation to Saint Anne, an episode recounted in The Golden Legend and in the Apocryphal Gospels. An angel appeared to Saints Joachim and Anna to tell them that they will be parents of a girl whom they will call Mary. 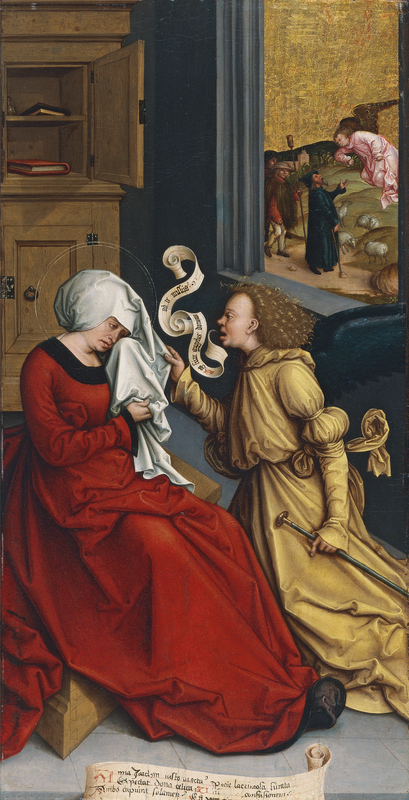 Strigel chooses the moment when the angel delivers the message to Saint Anne. The mother of the Virgin is depicted sitting in a simple room with the angel kneeling by her side, from whose mouth emerge the words of the holy message. Visible in the background through a window is a second scene in which the angel communicates the divine message to Saint Joachim. The figures are depicted with notable realism and without any form of idealisation. Saint Anne is thus shown as overwhelmed and weeping uncontrollably. Strigel’s manner of depicting the folds of the figures’ draperies and the colour contrasts is particularly distinctive, for example, the intense red of Anne’s garment and the gold of the angel’s. The story of the Annunciation to Saint Anne appears in The Golden Legend and in the apocryphal gospels. These sources recount how Joachim, having had his offerings in the temple rejected for being childless, retired in great shame to the countryside with the shepherds who guarded their flocks. In the meantime, his wife waited for him, praying and bitterly bewailing her barren state. One day an angel appeared in the countryside to Joachim announcing that his wife Anne would give birth to a girl whose name would be Mary and whose childhood should be consecrated to God. Having said this, he told Joachim to go to the Golden Gate of the city where he would find his wife Anne. According to The Golden Legend, the angel repeated the same message to Anne. In this small panel Strigel depicts the episode in a highly distinctive manner, filled with realism and simultaneously depicting the two annunciation scenes to Joachim and Anne, the Virgin’s parents. In the foreground we see the annunciation to Anne and in the exterior through a window the annunciation to Joachim. In the foreground scene, which is separated from the viewer through the thick floor tiles, we see the seated Anne with a vigorous, energetic angel on the right kneeling on the ground. Strigel makes no attempt to present the angel’s face as idealised. From its open mouth it would seem that the angel is shouting aloud its message, repeated on the scroll in front of its face. Saint Anne, receiving God’s messenger inside her home, has red, swollen eyes from crying and uses her white headdress whose folds hang down over her shoulder as a handkerchief. Seemingly too affected to notice the presence of the angel, the divine messenger is obliged to tug at her headdress to attract her attention. In the case of Joachim, rather than an annunciation, Strigel appears to establish a dialogue between that figure and the angel, to judge from the position of Joachim as he looks up, leaning on his staff and extending his arm towards the messenger from God. The panel was cut down in the past on all four sides, particularly at the bottom where it has lost some of the inscription. Lübbeke praised this small panel for its intensity and the quality of the composition, painted in the artist’s best manner. She also praised Strigel’s approach to the subject with its emphasis on detail and the way that the different elements of the narrative are inter-related. Particularly striking are the colours, with the vibrant red of Saint Anne’s dress contrasting with the gold of the angel’s tunic. Both stand out against the cool grey of the stone interior in which the only piece of furniture is the cupboard with the upper part open to reveal shelves. The same approach to colour is to be found in the secondary scene through the window. The painting may have formed part of a larger ensemble and various authors have proposed other panels as belonging to the same group. Lübbeke, however, considered it possible that the artist may have conceived of this delicate panel as an independent work, and dated it around 1505–10. 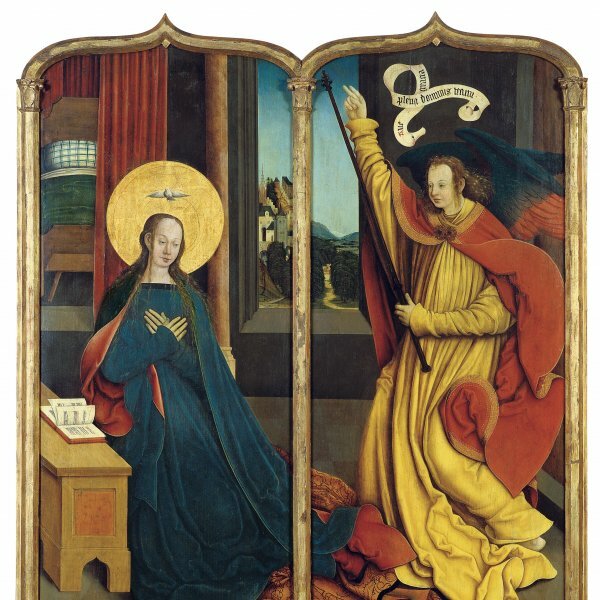 The Annunciation to Saint Anne was correctly attributed to Bernhard Strigel by Mayer when it was in the Traumann collection in Madrid in 1912. After that it is recorded in the Robert von Hirsch collection in Basel, during which time it was included in its first exhibition in 1925 at the Städelisches Kunstinstitut in Frankfurt. It was auctioned at Sotheby’s Parke-Bernet in London in 1978, the date when it was acquired for the Thyssen-Bornemisza collection.